Many may perceive this comedy rock band as a one-hit-wonder as they are most known for one particular song on YouTube however if you were to dig deeper, you will soon discover they are anything but. 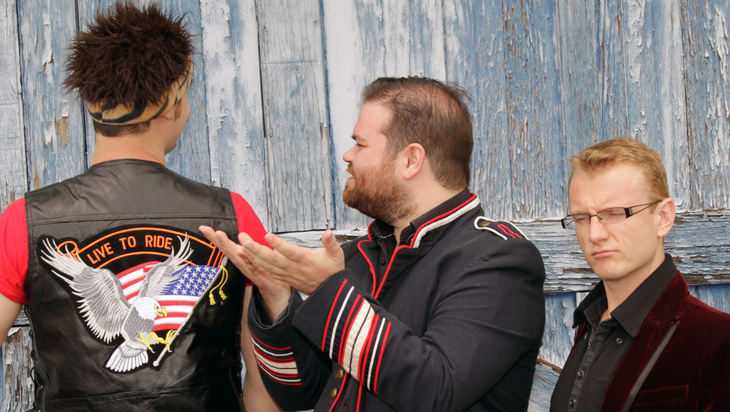 The Axis of Awesome are a pop rock sensation that specialize in parodying hit songs. Viva La Vida Loca Las Vegas begins with a perfect parodied medley of the three songs that created the show’s title: Viva La Vida (Coldplay), Living La Vida Loca (Ricky Martin) and Viva Las Vegas (Elvis). Fortunately this is an excellent combination that appeals to all of the age groups in the audience who immediately rise to the mood of the occasion. The band’s set is a good mix of their newer songs as well as reprising some songs from their first album, Animal Vehicle. Jordan Raskopoulos has the energy levels of the crowd on a consistent high as any band front-man would while guitarist Lee Naimo demonstrates some deliberately transparent character work, most notably in a one-man song about his criminal ways. Both Raskopoulos and Naimo use their trademarked “picking on the little guy” on keyboardist Benny Davis throughout the show to great comic effect. After a multitude of syllable perfect parodies and some original works, the band open up the show for some audience participation which gave them a chance to get intimate with their audience. No doubt every evening’s performance will bring something different; for the show I attended there was shameless dad-dancing going on and also some “Choke ’n’ Stroke” action – something you’ll only fully enjoy when seeing it live. The show wraps up with the band’s constantly evolving claim to fame Four Chords song. This song – which is possibly the only musical remix to contain Elvis, Green Day and Miley Cyrus together – is a clear crowd favourite, getting laughter of recommendation almost every fifteen seconds. All in all, The Axis of Awesome delivered a very fun and well-formatted ‘rockstravaganza’. It is a high energy and highly theatrical show which will bring a smile to everyone. The Axis of Awesome are performing at The Famous Spiegeltent at Federation Square every day throughout the festival. For more details and to book tickets, click here. If you are impressed by Benny’s performance in the band, you should also check him out at the Hi-Fi Bar on April 17th where he will be doing some of his solo stuff as his alternate persona ‘The Human Jukebox’. *Editor note: I went to see Benny’s debut show at the Edinburgh Fringe last year – check out my Broadway Baby review here. I always look forward to attending a Silo Theatre production because I know I can expect a slick performance and an excellent night of theatre. I was particularly excited for BREL as I have only thus far seen plays by Silo and so was really keen to see how they would pull off this extraordinary collaboration of concert and cabaret. You may not know who Jacques Brel is – as did I – but you will find you have come across his music. In my opinion, this is the true mark of a great artist. He wrote over 300 songs in his lifetime and his legacy still lives on to today – many of these have been translated and performed by big names in the business such as David Bowie, Ray Charles, Frank Sinatra, Leonard Cohen and Nina Simone, to name a few. He is the third best-selling Belgian recording artist of all time and is known as one of the pioneering chansons in musical history. Jacques Brel is a singer-songwriter in its truest form. His songs provide a window into his soul and his perspective on life, love and the human condition. His writing style is often described as dark, cynical, witty, passionate and revolutionary which spring from his reaction and experiences growing up at the time of the German invasion of Belgium during the Second World War. Thank you to Jackson Perry for the photo! BREL, put simply, is absolutely breathtakingly phenomenal. Described as “cabaret noir”, it is a staggering homage and wonderful celebration of Jacques Brel’s works – twenty-one carefully selected songs performed by some exceptional vocal talent. Tama Waipara, Jon Toogood and Julia Deans are all household names in the New Zealand music scene and need no introduction. Rounding up the quartet is seasoned theatre veteran Jennifer Ward-Lealand, touted the “First Lady of Cabaret” who is also one of Silo’s trust board members. The set up of the performance space is incredibly gorgeous with its many vintage lamps peppered all over the stage; this intimate atmosphere is heavily nostalgic of the smoky, dimly lit underground jazz bars commonly found in New York and Berlin. This set the mood and tone of the show immediately and increased my excitement considerably. From the moment the quartet took to the stage and the four-piece band kicked in, you are completely transported into the profound and fascinating world of Brel. His music is considered one of the major influences in contemporary music today and I can see why – his songs are timeless anthems that speak of both the joy and pain that is inevitable in life and love. The songs are a perfect marriage of stunning melodies and absolute poetic gold – heartfelt, poignant and gut-wrenching. Every song is performed to perfection with lots of heart and personality, a hint of cheek, and bucket loads of attitude and flair. Each performance transitions seamlessly and effortlessly to the next and with each song, you are left wanting more. I thought all four performers emoted and interpreted the songs brilliantly; they had great intuitive musical timing and consistently delivered the story behind each song compellingly and with conviction. From haunting ballads to energetic anthems, performed both in English and fluently in French, the song list is an eclectic mix to suit any musical taste bud. Equally as flawless are “Balkan music titans” Dr. Colossus, the extremely talented men behind the music. Under the skilled direction of Leon Radojkovic, the band come together smoothly as one voice, either to help instill a sense of drama, build up the narrative of a song or simply to complement the vocal performance. Throw in the well-timed, effective use of lighting too and what you get is sublime and decadent music magic. BREL is a cabaret and theatrical masterpiece and an absolute triumph. Michael Hurst’s accomplished direction has succeeded in creating a mesmerizing and unforgettable musical tribute to one of the greatest artists in the twentieth century. This is not only a vocal spectacle and musical journey you must experience but one that you NEED to. BREL is at the magnificent Concert Chamber in the Town Hall until 24 November. For more information and to buy tickets, click here. I first heard this song when he performed it in Auckland and fell in love with it within like 5 seconds! The tempo is quite “sleepy” and the melody is very simple but as an overall track it works and is just so beautiful. The lyrics are (mostly) short and succinct – which is an oddity when it comes to his songs! – but so meaningful and heartfelt. I’ve always enjoyed Jason’s music videos because they are so different from what is out there. His videos are carefully thought out and just so unique. I won’t say any more but as always, will let Jason work his magic! If you have fallen in love with this song, please purchase it on iTunes so you can listen to it over and over again! Cannot wait for his new album but this song should tide me over. On We Sing, We Dance, We Steal Things the song I could listen to over and over again was A Beautiful Mess (still is! ); I Won’t Give Up is definitely this year’s Beautiful Mess – I can already tell! He sings with so much heart and soul, he scats effortlessly, he plays the guitar like a boss (especially considering he is self-taught! ), he writes his own songs, he raps like a pro and even sings opera – is there anything Jason Mraz can’t do? About 3 weeks ago, I attended his concert – or more appropriately called, his “acoustic evening” – at the Civic and that was easily the BEST thing I did all year. I have been a fan for a long time (from the beginning), and I had been hoping and waiting for YEARS for him to come this way for a gig. I was beyond ecstatic when I found out he was coming; I purchased my tickets TWO MONTHS prior on day one of the fan pre-sale – which resulted in (I thought) the best seats in the house 🙂 Not only was I mere feet away from the stage but I was clever and lucky enough to have picked seats that were right smack bang in front of the mic! I have watched some of his performances online but nothing could honestly prepare me for what I was about to experience on the night. He is already ‘aMRAZing’ as a recording artist but he is absolutely phenomenal live. Completely different energy and his voice almost takes on a whole different persona. One of his trademarks is that he is very improvisational with his performance; he has said many a time in interviews that he rarely performs the same song the same way more than once. And this is so true. Even though many of the songs were tracks I had heard a million times, it was like I was listening to them for the first time. From start to finish, I was completely mesmerized. What made the experience that much better was how he engaged with the crowd – he is very charming in real life! He had some really funny stories to tell but also heartfelt words of inspiration to share. I also loved all the audience participation bits – quite an integral part to the overall evening. He has said in an interview that when he performs live it’s not about people coming to stare at him for 2 hours but it’s about everyone coming together to enjoy the music and participating in the experience. To me, that speaks a lot about him as an artist and really just makes me love and respect him even more! I think it is this perspective that he has that explains why he also incorporates other singer’s songs in his performance which I think is so refreshing. I definitely, totally fell in love with him even more after watching him live ❤ The only thing I wished was that he wasn’t sporting the long hair and was wearing his trademark fedora! He’s still incredibly cute though, and just such a down-to-earth and genuine person. I have been listening to his music non-stop since then and watching countless videos of his other live performances all over the world and I just cannot get enough of him!! He truly has a remarkable gift – he has such a beautiful character and tone to his voice and I think what’s even more appealing than that is just the way his songs tell a story. He is such a fantastic lyricist; the way he expresses himself through song is a breath of fresh air – he is so clever and sometimes whimsical with his words. His songs are all full of meaning, heart and soul and even though he is singing to a crowd of hundreds or thousands he has this uncanny, amazing ability to perform as if he was singing to only you. And I have to say he has some crazy breathing skills; how he gets out so many words in one breath (and so succintly too!) is beyond me. I must also mention the extremely talented Toca Rivera, Jason’s percussionist/right-hand-man who is a star in his own right, in my opinion. His vocals perfectly complement Jason’s and don’t get me started on how he works his magic with all the percussion instruments he has at his disposal! During the few times I wasn’t so busy staring at Jason, I was completely sucked in to Toca in action. I didn’t record any videos myself because I just wanted to fully enjoy the evening without getting distracted, but thanks to Youtube there are quite a number out there and I’m going to share some of them here – because I don’t think my words can really justify how amazing he is! There were, of course, SO MANY to choose from – I knew I couldn’t put them all here so I’ve picked the better quality ones and (hopefully) a good mix of tunes. If these whet your Mraz appetite then go check out the other performances on Youtube, they’re not difficult to find. When this happened, I pretty much died of jealousy right there and then – no doubt every girl in the crowd was completely jealous of Esther! Even now after the fact, every time I watch this video I get so sick to my stomach with jealousy! I hope I am fortunate enough to get to sing a duet with him one day…a girl can hope! This song leaves me so gobsmacked each time. His range is mind-blowing – not only can he go really low but to be able to go operatic as he does here is just incredible. I also love the words behind the song too – one of my faves, in terms of the lyrics. Some of you may have heard this song on the radio – apart from his “hit singles” this would be another familiar song to the non-Mraz-fan ear because he won a Grammy for this song a couple of years back. I think it has a very interesting beat to it, always makes me feel happy when I listen to it! This is one of my fave up-tempo tracks from him – I can’t get over how dirty the song is though, LOL. I love the scatting he does in this performance, and the guitar lick at the beginning is freaking wicked!! A new track which I hope will make it onto his next album!! I love the guitar riff in this track and the harmonies between him and Toca are beautiful! The lyrics are really interesting too if you listen closely. And finally, I will leave you with the song he is best known for, with a little bit extra at the end! Thank you, Jason Mraz, for coming to New Zealand. You changed my life that night – something you said near the end really spoke to me and changed my entire perspective on life. So thank you!! I can only hope I will be fortunate enough to watch you perform live again.